A Compact Disc player (often written as compact disc player), or CD player, is an electronic device that plays audio Compact Discs. CD players are often installed into home stereo systems, car audio systems, and personal computers. They also manufactured as portable devices. Modern units support other formats in addition to CDs, such as DVDs, CD-ROMs with audio files and video CDs. DJs often use players with an adjustable playback sampling rate to alter the pitch of the music programme. Many modern CD players also play MP3 CDs. 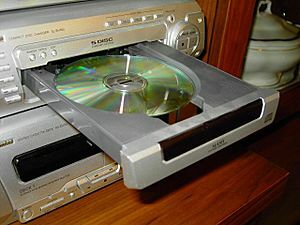 CD playback functionality is available on all modern CD-ROM/DVD-ROM drive equipped computers as well as on DVD players and CD-ROM/DVD-ROM based game consoles. Many CD players are contained in a plastic and steel casing which also houses the electrical system and the user interface. The housing of a portable CD player also contains ports used to connect the player to a powered or unpowered speaker, headphones and/or a power system (see electrical wiring in the United States or in the UK). A portable CD player generally contains an internal power source in the form of batteries. The housing of a stand-alone CD player contains speakers and perhaps a radio and/or tape deck. CD players used in component audio systems contain a power source, the user interface, and numerous ports to connect the player to the various parts of an audio system. Sony released the world's first CD Player called the CDP-101 in 1982 utilising a slide-out tray design for the CD. As it was easy to use and manufacture, most CD player tray designs had followed this style of tray ever since. However there have been some notable exceptions. During the launch of the first prototype CD player 'Goronta' by Sony at the Japanese Audio Fair in 1982, Sony showcased the vertical loading design of the CD player. Although the prototype's design was never really put into actual production, it was for a time adopted for production by a number of early Japanese CD player manufacturers including Alpine/Luxman, Matsushita under the Technics brand, Kenwood and Toshiba/Aurex. For the early vertical loading players, Alpine sourced their AD-7100 player designs for Luxman, Kenwood and Toshiba (using their Aurex brand). Kenwood added their 'Sigma Drive' outputs to this design as a modification. A picture of this early design can be seen on the Panasonic website. In 1983, at the US and European launch of the CD format, Philips with their CD100 CD player (sold as Magnavox in the US), showcased the first top loading CD tray designs. The design had a clamp on the lid which meant the user had to close this over the CD when it was placed inside the machine. Apart from having no motors accessing a movable tray, thus interfering with the player's sound quality, as the disc was clamped right down within the player, it implied better sound quality. This was one of the primary reasons manufacturer Meridian created their MCD CD player, whose chassis design was derived from the Philips CD100. Apart from being adopted on various stereo equipment designs such as mini components, over the years only a handful of hi-fi quality top loading tray CD players had been made. The most notable were Luxman's D-500 and D-500X series players, and Denon's DP-S1, both launched in 1993. Meridians 200 and 203 players were the first players to adopt tray loading with sliding play mechanism. Basically as the tray came out to collect the CD, the entire player's transport system also came out as one unit. 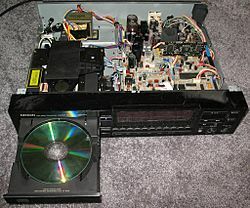 The players were also the first to utilise the CD Transport design whereby the audio electronics were separate from the CD drive mechanism itself to reduce jitter and distortion. A few companies produced CD players with dampened trays. The dampers were rubber grommets built into the tray to reduce distortion. Yamaha's CDX-1000 CD player was a good example of this design. Slot loading is the preferred loading mechanism for car audio head units, the Apple MacBook, PlayStation 3, amongst other audio players. There is no tray that pops out, and a motor is used to assist disc insertion and removal. Mini-CDs and non-circular CDs may have troubles with insertion and/or ejection. the swing-arm mechanism, originally design by Philips - the lens moves at the end of an arm, very much like the old turntables. the radial mechanism, designed by Sony to avoid using Philips patent, which is the one used in most CD players nowadays (because it is cheaper) - the lens moves on a radial rail. It is also known as 3-beam linear tracking. The swing-arm mechanism has a distinctive advantage over the other in that it doesn't "skip" when the rail becomes dirty. The swing arm mechanisms tend to have a much longer life than their radial counterparts. The radial mechanism works best for CD-Roms, though, as the speed of the disc increases. A CD player has three major components: a drive motor, a lens system, and a tracking mechanism. The drive motor rotates the disc between 200 and 500 revolutions per minute. The tracking mechanism moves the lens system along the spiral tracks in which information is encoded, and the lens reads the information using a laser beam, typically produced by a laser diode. The laser reads information by focusing a beam on the CD, which is reflected back to a sensor. The sensor detects changes in the beam, and interprets these changes to read the data. This data is output as sound using a digital-to-analog converter (DAC). A subcode in an audio CD contains information on the total number of audio tracks, the running time on the CD, running time of each track, and other information. This information allows the drive motor to speed up or slow down as needed to read data at a constant rate. The interface of a CD player does not vary widely from manufacturer to manufacturer. It is usually composed of a few buttons and a display device. Common buttons include play, pause, stop, advance/fast forward, back/rewind and, in the case of a multiple-CD player, disk selection. The display may provide information such as track number, track time, disk number in the case of multiple-CD changers and CD-Text. A CD changer holds multiple Compact Discs, usually in a cartridge, and allows the user to access (or play) any of them, one at a time. 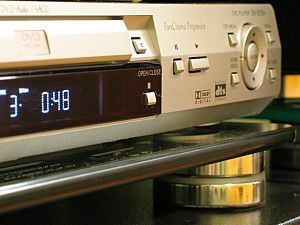 CD changers are commonly found in home cinema systems, cars, and less often in computer equipment. Prior to real CD changers being introduced, an attempt was made to copy the double cassette players found in many audio systems. As a result, devices with two separate, fully functional CD players were made. Very few cassette changers were produced, mainly because a double-cassette deck could copy from one cassette to another. Double-CD decks, on the other hand, did not have this copy functionality since recordable CDs were not commercially available. Therefore, the shift to changers was swift, removing the need for double CD players. External cartridge CD changers have one or more cartridges that the user loads with up to 12 different CDs (depending on manufacturer) and then inserts into the CD changer. 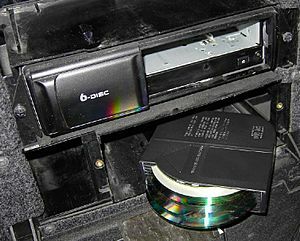 The CD changer can then remove one CD at a time for playing. This type of player is commonly found in vehicles because the user can switch easily between large amounts of media contained in different cartridges. 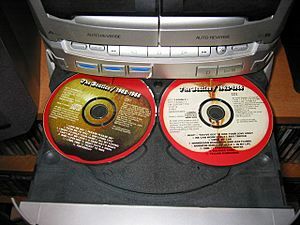 Internal cartridge CD changers work on the same basic principle as external cartridge players, except the cartridge never leaves the CD player. This type of CD player accepts multiple CDs through a single slot and stores them internally. A carousel type CD changer consists of a circular platter that holds three or more CDs. Traditional carousel CD players hold three, five, or seven discs on a flat carousel tray. The carousel ejects to allow access to the CDs. Once back inside, the CD changer can rotate the carousel to access all of the CDs. Such carousel CD changers often allow the user to rotate the carousel while open, and change all CDs if no CDs are currently playing, or to eject the carousel while one CD is playing to change any CDs accessible from that position. Another type of carousel CD player is the mega-disc or "jukebox" CD players as they are also known. They usually hold anywhere from 50 to 300 discs. The mega-disc CD player holds its discs in a vertical position in slots that located 360 degrees around the carousel. When a disc is selected to be played, the carousel rotates so that the disc can be picked up by a pickup mechanism and placed in CD playback unit. Mega-disc CD players generally have a means of entering in titles of the CDs stored inside them, such as telephone style letter input system found on the remote control, a full letter keypad on the unit, or by use of an external keyboard attached to the unit. Many units can also automatically obtain the title of a CDs if it contains CD-Text info stored on it. Digital audio players have surpassed the concept of CD changers. For example, the first generation iPod can hold an equivalent of 50 discs (1000 songs) with a 128k bit rate for each song; thereby, the iPod is 1/10 the size of a CD changer cartridge, and about 1/20 the size of a carousel changer. Solid state flash-based digital audio players have rendered compact discs and thus CD changers obsolete for some purposes. While digital audio players often use a lossy compression scheme, they usually can accept lossless formats such as WAV (PCM) as well, matching the quality of CD audio. CD-ROM changers existed in the early 1990s as an expensive external drive, often connecting through the SCSI interface. The changer concept is seen on the computer as one drive letter for each corresponding disc number. The computer refers to the disc by its drive letter, and the changer machine loads the disc transparently. Changers are often used by enterprises hosting software (i.e. Encarta Encyclopedia, library software) on a server, at a time when the mean hard drive capacity was measured in hundreds of megabytes. The changer has been supplanted by exponential growth of hard drive storage densities, enabling several CD's worth of data to be stored on the drive and replacing the changer for such purposes. Compact disc player Facts for Kids. Kiddle Encyclopedia.